﻿ News Bharati - Jaitley wonders whether Kharge has brought down the value of dissent..! News Bharati - Jaitley wonders whether Kharge has brought down the value of dissent..! Jaitley wonders whether Kharge has brought down the value of dissent..! New Delhi, February 4: “Mallikarjun Kharge’s dissent in the matter of the transfer of Alok Verma was coloured by his political views. He has dissented a bit too frequently. Many may wonder if Collegium’s are workable. The appointment of a CBI Director was never envisaged to be a political battle. Kharge has made it look like one”, opined the Finance Minister Arun Jaitley targeting the opposition citing the appointment of new CBI director Rishi Kumar Shukla on Saturday. “The leader of the largest party in Opposition in the Lok Sabha Mallikarjun Kharge dissented once again in the appointment of the new CBI Director. Kharge dissents regularly. 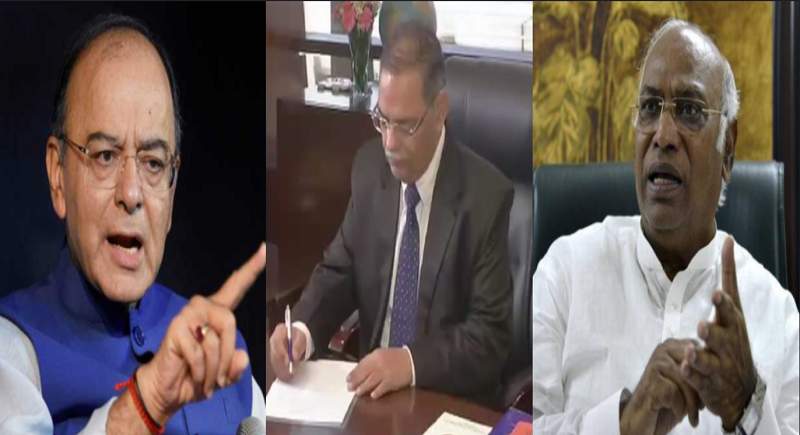 He dissented when Alok Verma was appointed, dissented when Alok Verma was transferred and has now dissented when R. K. Shukla has been appointed”, commented Jaitley saying that Kharge’s dissent being the only constant thing dealing with the CBI Director’s appointment and transfer. Former Madhya Pradesh police chief Rishi Kumar Shukla took charge as the new CBI director on Monday, with his first major challenge coming from Kolkata where the agency’s attempt to question city top cop Rajeev Kumar triggered a confrontation between Mamata Banerjee and the centre. Stressing at the formation and work structure of the collegium, Jaitley continued to slam the opposition saying that when the Leader of Opposition sits as a Member of the Collegium, he sheds off the political colour of his office as much as that of the Prime Minister and the Chief Justice of India shall both leave the authority of their respective domains. “The collegium should work exclusively towards appointing or transferring the Director on the criterion of merit or fairness. Kharge then is a part of a Collegium, which discharges a governance function. Unfortunately, that does not seem to have happened”, he added alleging that his dissent was influenced by the party he belongs to. Dissents are a powerful instrument in democracy. They are more commonly prevalent in judicial pronouncements. Dissents are also a part of the parliamentary system particularly in the Legislative Committees. The dissenter places an alternative view point. Where Monetary policy Committees exists, dissents are occasionally given by Members. Dissent in appointment Collegium are rare but not unknown. The dissenter is an assertor. He values his views. He represents an alternative view point. A dissenter challenges the majority. He does it on the basis of a call of conscience dictated by his fair mind. He puts his dissent on record so that it can be of value to the wisdom of the future generations. A dissent should never be a political tool. The right to dissent is sacrosanct and has to be sparingly used. If a dissenter dissents on every conceivable occasion he comes out as a person either motivated by collateral reasons or as a person lacking objectivity. Kharge’s dissent in the matter of the transfer of Alok Verma was coloured by his political views. He was a petitioner in the Supreme Court himself in support of Alok Verma. He should have recused himself from the Committee since his views were known. He suffered from a bias and conflict of interest. Yet he did not recuse himself. The only task before the Committee was whether the CVC report contains the adequate material for transfer of the Director or not. He wanted the Committee to either ignore the CVC report or sit in appeal against the finding of the CVC something which was beyond the jurisdiction of the Committee, he signed off.